Happy campers! Camp Kissing Tree Spring Break-style was one of those unforgettable camp experiences! More than 500 Creators, Foodies, Voyagers and Champs enjoyed great food and entertainment. Thank you, KT Residents, for opening the Hall to our guests and showing them how truly special it is to live legendary at Kissing Tree! We had a buzzing weekend after the event with so many of your friends visiting the Welcome Center and choosing their future homes here in our community. We look forward to making this event even better for residents and guests. Congrats to resident Judy C. and her guest Patt D. – they’re going to be planning a trip together this year with $5,000 in travel money. We can’t wait to continue this new tradition on July 2nd with an Independence Day Celebration including fireworks on the driving range and a Jimmy Buffet cover band. Watch for RSVP emails coming soon. Residents will have the first opportunity to RSVP and reserve a spot for their guests before the event is released to the future residents on the interest list. 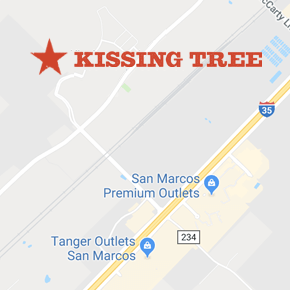 Check out all of the fun memories below and be sure to follow us on Facebook for all things Kissing Tree!